Lucia Cervoni has been described by Canada's leading national paper The Globe and Mail as "Tall and statuesque, she has a voice on the darker side, and blessed with this natural color, she has a distinctive sound that should take her far." 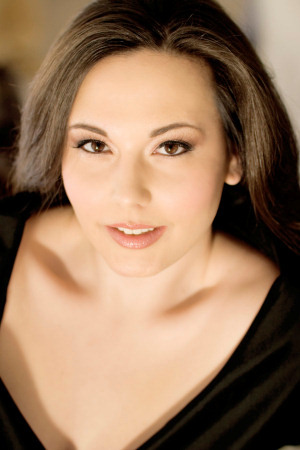 Canadian opera singing sensation, mezzo-soprano Lucia Cervoni took time out of her busy schedule to answer my questions via email. She loves opera so much she even married a fellow opera singer, tenor Gregory Warren, a graduate of the distinguished Placido Domingo-Cafritz Young Artist Program in Washington, DC. She discusses what sparked her interest in opera, opera singers she admires, her favorite roles and how she prepares for them, and lastly how she wants to leave her mark on the world. When did you decide to become opera singer? This moment is a very vivid one for me. I was in the 8th Grade at St. Mary's Choir and Orchestra School back home in London, Ontario, Canada. One of our vocal/orchestra teachers was signing the cover of our Grade 8 "musical in revue" poster. He wrote, "great job, you should try a career in opera." In that moment a light bulb was turned on inside of me. I always knew I wanted to sing, from a very young age, but I didn't know how or in what type of art I would use my gift. As soon as he said opera, I investigated the art further and realized that's where I finally fit in. What opera singers do you admire today and from yesteryears? There are so many that I admire. The few that come straight to mind from yesteryear's are: Joan Sutherland, Christa Ludwig, Regina Resnik, Mirella Freni, Fiorenza Cossotto and Luciano Pavarotti. Singers today: Natalie Dessay, Patricia Racette, Patricia Bardon, Violetta Urmana and Diana Damrau. What have you been doing recently and what are your current plans? Currently I am living in Germany and working as a Soloist at Theater Magdeburg. It is currently a two year "fest position" contract. This year I sang, 2nd lady in Die Zauberflote; Singer in a production called Liebeslieder; Sonjetka in Lady Macbeth von Mtsensk and sang in for Maddalena in Rigoletto and Schenkwirtin/ Amme in Boris Gudounow. Next season, I'm singing Diane in Orpheus in der Unterwelt, Carmen in Carmen, Laciesca in Gianni Schicchi and returning to the role of 3rd lady in die Zauberflote. What has been your highlight in your opera career so far? I have had so many wonderful opportunities in my career so far that have led to some pretty magical moments. I would have to say finding out that I got the job here in Germany and being here in Europe and working everyday as a professional opera singer. That is a pretty thrilling experience to enjoy everyday. You are currently singing in Europe. How is that going? Making the decision to come to Europe was an easy one for me. I always knew in my gut that I would make my way here. Both my husband and I have been extremely fortunate to find work here in Germany. I would be lying if I said that it didn't take a little while to get used to the way of life over here, but I have never been so satisfied in my art. I am so blessed to wake up everyday and go to work to sing! It's one of the best decisions I've ever made. Favorite role? There have been a couple. I really enjoyed Gluck's Orfeo and Cornelia in Giulio Caesar, however playing Carmen in Brook's the Tragedy of Carmen was definitely a highlight. The story follows more closely the story from Prosper Merimee's novel, but still uses the music from Bizet's Carmen. It is, for me the perfect combination. I was a part of a very minimalistic production in Seattle's YAP and the combination of cast and director was so enriching. I found myself getting lost in Carmen and craved to experience her more and more. I love that feeling. I've been quite enjoying my season this year. I started the season with jumping into the role of Sonjetka. It was a last minute thing, and I had to learn the role in less than two weeks with about twenty rehearsals and with seeing the conductor only once in our only general rehearsal. I thoroughly enjoyed it for giving me such a challenge. I had already sung Dritte Dame at Santa Fe Opera and was excited to sing Zweite Dame as well. This production was a premiere for the Theater and I loved the process. The entire team is great and it was my first rehearsal period that I experienced all in German. I am lucky to say that everyone here at Theater Magdeburg is completely patient and kind with me. Schenkwirtin/Amme was a role that I was supposed to start the season with, but then I was asked to be Sonjetka instead. However, I am once again jumping back into the role for one performance in April. I had the pleasure of seeing the premiere of this show and I'm very excited to be apart of this piece. Speaking of jumping in at the last second. That's exactly what happened for the role of Maddalena. I learned it on the morning of a performance. Another mezzo at the house, that normally does this show was sick. They asked me if I knew the role. I said no, but said I could probably learn it. Therefore, I learned the part with great help from a wonderful pianist and sang it from side stage while the Assistant Director played out the role. It was such a thrill, I thoroughly encourage trying it! This leads us to the last piece. A premiere completely designed by our Intendant, Tobias Wellemeyer. It is his creation. An accumulation of songs, poems and dancing. We are still in the process of creating the show from scratch. I am having such a wonderful time in rehearsals. Not only do I get to sing gorgeous music, but I am being pushed to my creative limit in creating a story from poem to poem and song to song. I think it will be the highlight of this year's season. What is your dream role? What is your dream opera setting? Well I am delighted to share that I will be next year singing my dream role. Next year our theatre will be doing a premiere of Bizet's Carmen, and I will be Carmen. It's a dream come true for me. Your husband is also an opera singer. How do you make it work with your schedules? My husband is also a singer, a wonderful tenor who is singing with the Deutsche Oper Berlin. It was as if the stars lined up just at the right time, while I received confirmation that the Theater in Magdeburg had hired me for also a two year contract. Magdeburg in only an hour and 30 minute drive from Berlin. In singing terms this is like being down the street, it never happens. We are able to see each other when one of us is not required to be at a rehearsal or in a performance. Most of the time, I make my way back to Berlin by train. It's the closet we have ever been to having a "normal 9-5 schedule." We are having a great time here in Germany creating the next chapter in our lives, and most importantly we are able to do this together! I pick it apart. Learn the notes, learn the words, and put the words into my words. Put it all together with a coach, bring it to my teacher (hopefully before it hits rehearsal or the stage). Sometimes and most times my interpretation of the character is born directly from what she/he is saying, what others have said to me or about her/him. But as for the Liebeslieder production, for example, since it's a completely new piece, being written in the moment through many different texts, then my spin on what is going on is a complete reaction to what is taking place during the rehearsal process. It is for me something completely new and actually scary. I'm usually much more comfortable with knowing at least the arc of a show, but when the show is being born in the moment, I think an artist is expected to be malleable. It may be scary in the moment, but I know it will end up be very gratifying in the end. I'm not too sure if I can answer this question. I have many composers I enjoy to either listen to and/or sing. Different ones fulfill a variety of moods for me and or teach me and help me to discover things at different points of my development. However, if I had to pick just one, I would say R. Strauss is probably at the top of my list for right now. What advice would you give a younger Lucia? The younger me? I would of told her to live a little bit more out of her box. I'm learning that as I get older in life. You don't only have to keep only one thing in life as your focus. We as people have in each of us so many gifts. I would have told myself to investigate all of them. What advice would you give aspiring singers? Sing! If you love it and need to do it than just do it. Find a way. It's not the easiest road, but my response to that is what is?! If one has the opportunity to live out their passion in their life, then I say they are one of the luckiest people on this earth (and of course find a great teacher). Any chance you will ever perform in a Broadway show? Broadway, that would be great fun. However, and I am being completely honest, I have two left feet, ha! But one never knows. Any funny stories you can share with the opera world? I will never forget the time when we were on tour with Seattle YAP's The Tragedy of Carmen. Anya Matanovic, one of my dear and terribly talented friends, was playing the spoken role of 'Lilas Pastia.' We were in the middle of the ceremony scene, the "marriage" between Carmen (me) and Don Jose. In this scene, we were to drink a glass of wine each and break some bread. Well this one evening neither the Don Jose nor I finished our wine. Maybe she had poured too much, I can't remember. At any rate the next thing I notice is Anya below and behind the trunk, which at this point was also the makeshift altar, chugging the two rather big glasses of "wine." I think I almost choked of laughter at this point. She had to do it because she needed to pack everything up again to turn the altar back into the trunk. I don't know how I stopped myself from breaking down into complete laughter on the stage. I think I bit the inside of my cheeks until they were nearly bleeding. The next thing I notice, which seemed to me as forever, Anya popped back up from the trunk to continue the rest of the scene with us. Definitely a fabulous highlight. I always get so nervous around famous opera singers, especially those that I completely admire as marvelous performers. In the past couple of years I have had the pleasure of hearing Patricia Racette, Patricia Bardon, Placido Domingo and working with Natalie Dessay. Everytime I either went backstage to meet another performer I knew in the same production, I become again a twelve year old little girl at the back of a rock concert or something of their favorite band and I don't know what to do or say, it's completely embarassing. What do you want your headstone to read? I would love my headstone to read. Loving wife and mother. A creative soul who found her own way.